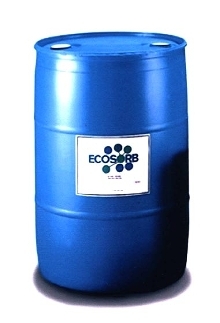 ECOSORB(R) breaks down and eliminates harmful gases, including hydrogen sulfide, sulfur dioxide, ammonia, ethyl mercaptan, and methyl mercaptan. It is diluted with water and sprayed into odorous areas as atomized mist. Droplets electrostatically attract molecules that form odor, then capture and neutralize them. Non-toxic, biodegradable, and safe to use in even the most confined areas, it is authorized for use by EPA and USDA. While many odor control techniques merely mask unpleasant odors, independent testing shows that ECOSORB(R) Natural Organic Odor Neutralizer effectively breaks down and eliminates harmful gases, including hydrogen sulfide, sulfur dioxide, ammonia, ethyl mercaptan and methyl mercaptan. ECOSORB is the only odor control product whose safety and effectiveness have been proved by independent labs, universities and olfactometry researchers. A broad spectrum odor neutralizer, ECOSORB is used in a variety of settings, including wastewater treatment plants and industrial facilities such as asphalt processing plants, food processing plants and composite fabrication facilities, among others. There are more than 200 installations across the United States and Canada. ECOSORB is typically diluted with water and sprayed into odorous areas in an atomized mist. The droplets electrostatically attract the molecules that form the odor, then capture and neutralize them, diminishing their volatility until they are reduced to their lowest possible form. ECOSORB feed systems are custom-designed for each facility. Typically, they can be installed quickly and require minimal capital outlay in comparison with other, more complex odor control systems. ECOSORB systems can often replace scrubbers and other elaborate equipment. Where scrubbers are necessary, ECOSORB essential oils can be used as a safe odor control substitute for potentially hazardous sodium hypochlorite, caustic or blended solutions. ECOSORB contains only ingredients that comply with the Toxic Substances Control Act. Non-toxic, biodegradable and safe to use in even the most confined areas, ECOSORB is authorized for use by the United States EPA and USDA. For more information about ECOSORB, visit our website at www.odormanagement.com, or call 1-800-NO2-ODOR (800-662-6367). Automated Systems neutralize acid waste in laboratories. Odor Neutralizer Additive targets personal care products. Dual-Purpose Coating prevents rust and neutralizes acid.